In addition to the full range of competitions, the Region also sends a team of swimmers annually to an Overseas Camp. This camp includes education, training and an opportunity for swimmers to experience competition in an international environment, away from their home club. Three training camps are run during the year as part of the England Talent Programme, focusing at Regional level on 12 year olds. These involve specific aspects of stroke development, land training and talks. The Region organises, assists and helps fund the training of Officials. We hold CPD seminars and mentoring courses to ensure all our Officials are kept up to date with new developments, and that competitions at all levels are staffed with the correct level of competence. As well as arranging coaching courses as and when required, the Region supports the development of Coaches by running seminars, workshops and conferences. Coaches are also encouraged to assist at the training camps and the Overseas Camp. Team Manager courses levels 1 and 2 are run as required. Club Team Managers have the opportunity to enhance their skills by attending the annual Coaches/Team Managers Conferences and assisting at training camps and overseas camps. Click here to view the Competition Calendar. Click here to view the current Regional Swimming Record holders. Booking for this is now live and it is recommended to book early to secure your place. We are pleased to announce that the meet information for the 2019 Regionally organised competitions is now available. Click here for the 2019 Summer Champs Qualifiying and Consideration Times. Click here for the Para Entry Document. Click here for the Para Entry Times. Click here to view presentation from the 2018 Parents Talk and click here for the document regarding The Youth Physical Development Model. On the First weekend of Regional Champs a talk about Nutrition took place click here for the presentation. Competition Conditions for all Regional Events. Mileage will be checked and verification may be requested before payment is made. 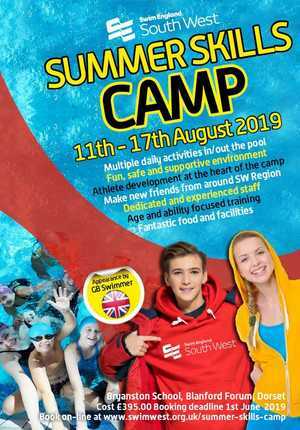 Payment for mileage will be made at an agreed current rate set by Swim England South West and will normally be between home address and the venue. If the journey starting point differs from the home address payment will be made for whichever is the shorter distance. Where an official has a competing swimmer at boarding school and travels from outside the region, mileage will only be paid from swimmer’s home club/school. Mileage between the pool and the hotel will be limited to 5 miles. Mileage is paid for officials who work for the whole day (i.e. at least 2 sessions one of which includes the finals) at Championship Meets or at other events for the whole competition (i.e. Sprints, Masters, Disability). Relays – at least 2 sessions to be worked. Applicable to Youth, Age Groups, Championships or any event with consecutive days. Maximum claim 1 night per weekend or 2 nights if work 3 days. Officials must work all sessions over both or all days, Journey must be in excess of 1 hour. Claims for accommodation on the night prior to competition (e.g. Friday night) are allowed if the journey is in excess of 75 miles or 1.5 hours in time and the official works two full days. Accommodation to be shared where possible. Accommodation costs will be considered for those who make an official request on the Officials form, and approved in advance. Officials will need to book their own accommodation and make a claim for re-imbursement on the Regional Expenses Form and include the receipt for both hotel and evening meal. Presently the maximum allowance is £80 for 2 officials sharing a double/twin room or £60 single including breakfast and car parking charges. Accommodation costs above this amount will not be refunded except with prior approval. This is normally paid for those who have approval for overnight accommodation. A detailed receipt MUST be attached to the claim form. If the receipt is for multiple people it must be clear which items are for the official. Current rate is a maximum of £17.50 per night (alcohol cannot be included).